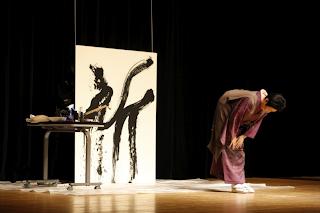 July 25, Fuyo Kobayashi, calligrapher, will write the word ARIGATO (thank you) at the Japan Festival on the eve of the Olympic Games in London. This will be in gratitude for all the support from the countries all over the world for the Great East Japan Earthquake. It will also be in accord with the festivals on the Day Out of Time being held globally to envelop the earth. It will be broadcast on TV. Ms.Kobayashi joined us last year on December 21 for “New Year Wishes to Prayers”. She will join us again this year on December 21, 2012. Her calligraphy is the energy of prayer itself.